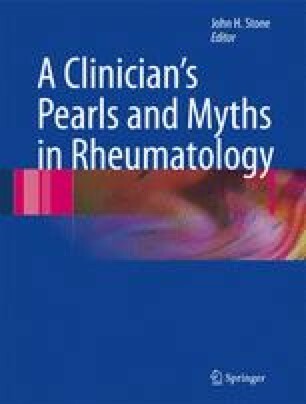 In reactive arthritis (ReA), exposure to an infectious agent leads to the development of an inflammatory arthritis and other characteristic clinical findings. However, this syndrome occurs in the absence of an ongoing infectious process. About 50% of ReA and undifferentiated oligoarthritis cases can be attributed to a specific pathogen by a combination of culture and serology. The predominant organisms are Chlamydia, Salmonella, Shigella, Yersinia, and Campylobacter species. The frequency of ReA following exposure to potential etiologic agents is between 3% and 10%. ReA characteristically involves the joints of the lower extremities in an asymmetric, oligoarticular pattern. The presence of HLAB27 increases disease susceptibility, but is neither sufficient nor necessary for ReA to occur. Individuals who are HLA-B27 positive tend to have more severe and longer episodes of ReA. A dactylitis (“sausage digit”) pattern of arthritis in the feet is typical of ReA, as it is of psoriatic arthritis. ReA has a predilection for joints of the lower extremities, usually in an asymmetric, oligoarticular pattern. Enthesopathy and anterior uveitis often occur in ReA.